Before you're legally allowed to test a new hire for illegal substances, you must obtain their consent. As with any background check, the individual must know that they are being tested, which screens will be run and that the hiring decision is contingent on the results of the background check. Typically when a new hire fails any type of background check, the employer must follow the FCRA stated rules of adverse action. When the new hire fails a drug test, however, the employer's next action depends on where the results are coming from. If a consumer reporting agency or background company are supplying the drug test results as part of an overall background screening, then the employer must follow adverse action procedures. If the drug test results were delivered directly from a lab, the employer actions are not subject to FCRA guidelines and the job offer can be withdrawn. As previously stated, the employee must give consent and authorization before they can be screened for illegal substances. Typically, however, the employer isn't going to ask a current employee to give consent when they are randomly screened or tested due to suspected use. The employer will have already obtained consent through a drug and alcohol or substance abuse policy that covers all employees. The policy will let employees know that they can be randomly screened, especially if the employer suspects drug use that could affect the employee's job performance. Employers may also wish to screen employees involved in workplace accidents. The policy will then state what steps will be taken if the employee fails the drug test. Employers must also be aware of which jobs require regular drug screening and which states have specific laws regarding drug tests and employment. For instance, even though marijuana is legal in some states, employers can still fire an employee for a positive result for marijuana. Some states may also prohibit an employer from firing an employee based on the first positive drug test results and require an employee assistance program to help. Your substance abuse policy may be helpful in getting the employee some treatment so they can be retested and return to work. If an employee is already working for your business and several screenings reveal positive results, you will also want termination procedures documented in your substance abuse policy as well. 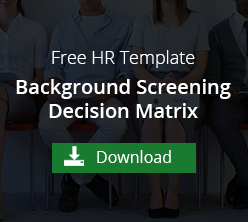 Make sure to document any behavior or suspicions for screening or terminating the employee. Also, employers must have a clear understanding of prescriptions or other medications that may affect the employee's performance. If you have any questions about background screening or drug testing, please contact us. We'll be happy to offer guidance!